Kilspindie castle and the Red Douglases. To the north of the East Lothian village of Aberlady behind the Victorian St Mary's Kirk, lies a few scattered stones of the ancient castle of Kilspindie. The present ruin contains the base of a doorway with a length of wall punctuated by oval gun loops of an early 1600's style and represent "the castell tower and fortalice biggit by Patrick Douglas of Kilspindie." noted in a document of 1612, when King James VI of Scots (1567-1603/25) granted the estate to the Hay family. Although there was perhaps an earlier Towerhouse on site built by the 'Red' Douglases in the early 1500's. Anciently the lands of Kilspindie are said to have been held by the Spens of Kilspindie. But this may have been in their role a vassal or tenant to a greater Over-Lord, possibly the Gospatricks (later known as Dunbar after their key coastal fortress.) From the Spens the Kilspindie estate appears to have passed to the Douglases then to the Hay family. Nearby are two other interesting historic ruins, the Carmelite Friary with its fish ponds and the great courtyard castle of Luffness, now only traceable by grassy mounds and a 'modern' 17th century Towerhouse on the site of the original Keep. Which was itself part of a huge quadrangular courtyard with corner towers surrounded by a fresh water ditch. In fact, Luffness was claimed to be one of "the keys to the Kingdom." and allegedly takes its name from the tomb of a Viking called 'Lofda' buried on site. This conjures up visions of Viking longships sailing into Aberlady Bay, then known as Lofda's point, to land their ill-gotten booty. There is also a second Viking tomb and during rebuilding work when these skeletons were discovered then quickly re-interred, one was said to be seven feet tall possibly 'Lofda' himself. Both 'Lofda' and his un-named companion appear to have been important sub-commanders to 'Anlaf the Dane' a notorious Viking raider in the area in the mid 10th century. However, the castle and the Friary are of a much later date being from the late 12th century onwards. At that time being held by the Gospatricks, Earls of Dunbar with links to the Lyndsays, Bickertons and Hepburns. Also within the Carmelite Friary is the tomb of a David De Lyndsay. The original tower of Kilspindie raised by the Douglases may have been oblong in plan as suggested by the conjectural reconstruction. And would have been surrounded by an enclosing 'Barmkin' wall with gatehouse protecting stables, brewhouse, barns and such like. The 'Barmkin' in turn would have been surrounded by a deep ditch. Also the land around must have been a tidal salt marsh which would have added to the defensive position. The late great Historian and Novelist Nigel Tranter suggested the castle's ditch was filled by the tide and trapped there by wooden dams when the tide withdrew, which sounds entirely probable, since the castle sat so far out in Aberlady Bay. Today the Bay appears to be nothing but mud flats. However, in 1500 the Bay was deep enough to allow merchant vessels to land their cargo for transport to the inland market town of Haddington. Locally the Douglas family held several towers, including Whittinghame, Longniddry and eventually Kilspindie. 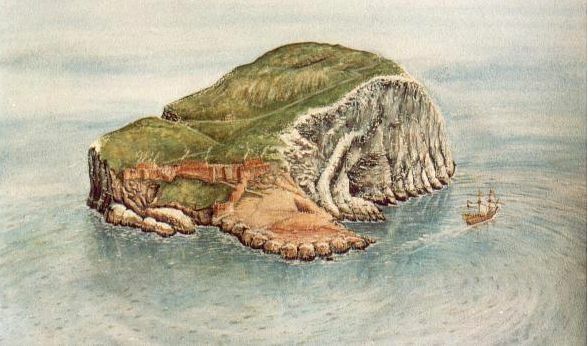 But the jewel in their crown would have to be the great curtain walled, coastal fortress of Tantallon perched on cliffs opposite the Bass Rock Island. 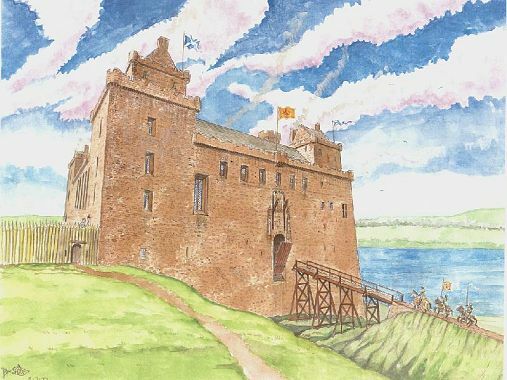 Tantallon was built after 1350 by William, 1st Earl of Douglas and passed in 1389 to his illegitimate son George 'the Red' Douglas, 1st Earl of Angus. Tantallon had many flamboyant and fiery 'Red' Douglas owners. One of note, and starting the connection with the Kilspindie, being Archibald, 'Bell-the-cat', (after his murder of King James III's friends at Lauder Brig in 1482), 5th Earl of Angus. Who, in a feud with Spens of Kilspindie tore off Spen's leg with one stroke of his great sword. This appears to be how the lands of Kilspindie passed to the Douglases. Also later Douglas of Kilspindie used the title 'Greysteel' which may refer to the sword stroke used to obtain the lands of Kilspindie. In 1528, Archibald Douglas, 6th Earl of Angus was counted as a 'rebel' along with his brother Sir George of Kilspindie by King James V of Scots (1513-1542). 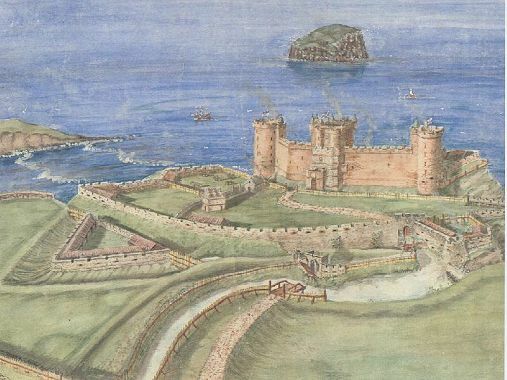 Resulting in the unsuccessful siege of Tantallon castle in 1528, followed by the successful assault in 1529 (through starvation and bribes) along with the seizure of Kilspindie likely by crown forces. The 'Red' Douglases then fled into English exile until the King's death in 1542. On their return to the Lothians the Douglases immediately sided politically with the English. In 1543, the English Ambassador, Sir Ralph Sadler hoped to buy the marriage of the infant Mary Queen of Scots (1542-1567/87) to the English Prince Edward through bribes to various Scots nobles. Such Lairds became known as 'assured Scots' because they favoured this union as well as English gold. Archibald Douglas Earl of Angus and his brother Sir George as 'assured Scots' offered their 'protection' to Sir Ralph Sadler housing him in Tantallon castle as a place to store and distribute these bribes. This greatly angered the Douglases old rivals the Hamilton family led by James, 2nd Earl of Arran, 'Governor' of the Kingdom. By November Arran ordered Sadler to return to England and commanded Lord Borthwick to prepare siege cannon for an assault on Tantallon. 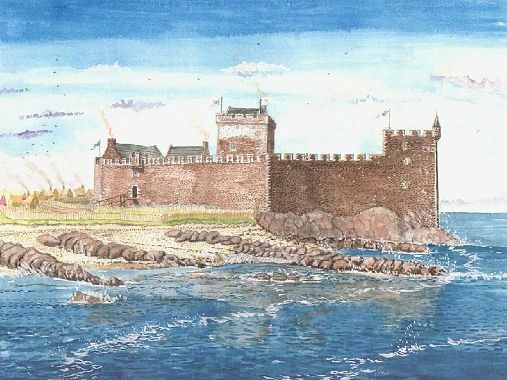 But Sadler refused to withdraw and continued to hide behind Tantallon's walls "of such strength." Arran then demanded that the Douglases should "...cause the said ambassador depart out of your said house of Temptallon" (Tantallon). 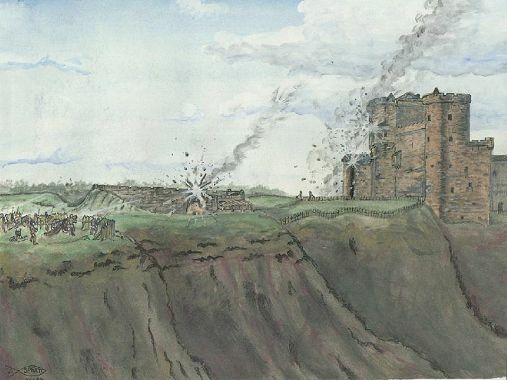 Fearful Sadler wrote to England "..the Governor (Arran)...will besiege this house of (Tantallon), which is strong enough to abide his siege..." He went on to explain the castle had plenty of cannon, gunpowder and coal but not enough food to resist a length siege if blockaded. This was the key factor in the surrender of Tantallon in 1529 due to lack of food, where King James V of Scots had blockaded by land and sea as well as a prolonged bombardment. The English failed to send supplies and Arran's proposed siege under Lord Borthwick was not forthcoming, since Sadler himself explains, writing from Berwick on the 12th of December 1543, "Mr Douglas came yesterday to me (at Tantallon) with an honest company of gentlemen....their number four hundred or there abouts, and hath this day brought me hither to safety." 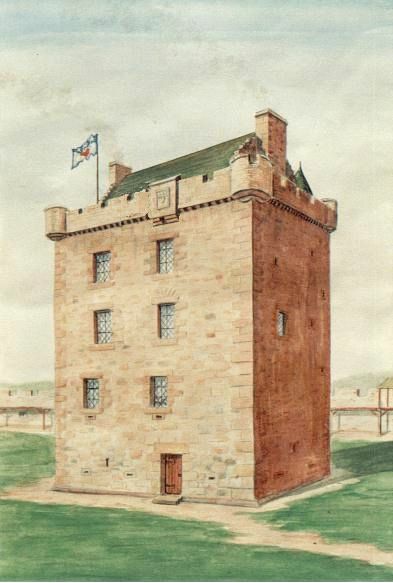 Later Douglas and his brother Sir George were arrested by Arran and taken to Hamilton castle. With the failure of Sadler's diplomacy and bribes the English, by 1544, resorted to fire and sword to try and win Mary's hand. Hence the days became known as the wars of the 'Rough Wooing'. Castles, Abbeys and villages throughout the Lothians and Borders were stormed, sacked and burnt. Men, women and children were all put to the sword. It should also be noted that the English invaders avoided assaulting Tantallon, allegedly because of lack of suitable siege cannon. 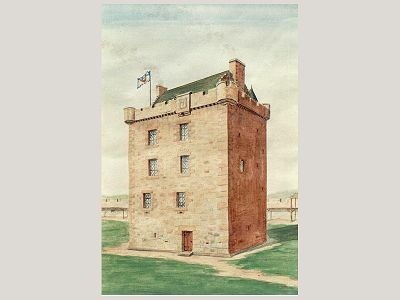 They also camped close to Hugh Douglas's Longniddry Tower without attacking it because Hugh was an 'assured Scot' and likewise neither is there mention of assaults on Whittingham or Kilspindie, while other towers nearby were sacked. Perhaps showing English diplomacy to protect Douglas interests in the Lothians. Out to sea the English support fleet under Captain 'Clynton' sailed up the Firth of Forth to raid the coastal prison fortress of Blackness. Which was described as 'the ship that never sailed' , because of its shape and position. The reason was this raid may have been that the English, mistakenly believed the infant Mary Queen of Scots was held at Blackness during their 'Rough Wooing' invasion. As Sadler indicated in a letter of July 1543 to King Henry VIII of England that , (Governor Arran).."will go to Linlithgow (Palace) until his whole force assemble, and if his enemies come forward he will remove the Queen to Blackness, which is impregnable." 'Clynton' attacked at night burning ships stationed alongside and releasing captive prisoners before as the English chronicler puts it, "..after a great conflict between the castle and our vessels, " the fleet withdrew without the infant Mary but among those liberated were Douglas Earl of Angus and his brother Sir George, who had been incarcerated by Arran for their collaboration. It later came to light that Douglas while captive had sent word to King Henry that if he invaded Scotland, Tantallon would be handed over for English use. This may have been the real motivation behind the sea raid. Nothing more than an elaborate jail break to ensure Douglas and his brother would still be useful allies. Unfortunately for the English the Douglases gratitude was short lived on discovering some of the English land forces under Sir Ralph Evers had inadvertently sacked Melrose Abbey, desecrating William the 1st Earl of Douglas's tomb, the original forefather of the 'Red' Douglases. Therefore, Douglas and his brother had no choice but to retaliate. Consequently, in 1545 the Hamitons and 'Red' Douglases set aside their differences to join forces and intercept an invading English army led by Sir Ralph Evers at the battle of Ancrum Moor, near Melrose. Initially the Douglas/Hamilton horsemen faked a retreat over the hillside hotly pursued by the English cavalry. Their infantry followed on too but were soon left some distance behind. Over the ridge hidden from view the Douglas/Hamilton horsemen dismounted to add their lances to the long phalanx of pikemen and spearmen foot soldiers assembled by their Border allies the Leslies and the Scotts. The English cavalry were taken totally by surprise, undaunted they charged down onto the forest of spears. But without their infantry hakbutters (riflemen) to help breakup the Scots ranks their horses were torn to pieces and thrown riders crushed underfoot. Then the confused and breathless English infantry arrived at the top of the ridge, but before the hakbutters could present an organised sustained fire, they too were torn down in the Scots charge. At this point mercaneries within the English infantry ranks switched sides to the Scots. With the defeat complete Evers, for his sins against the Douglas tombs at Melrose, was then skinned and his skin used to make purses for the Scots men-at-arms.